This month in our baking group , " We Knead To Bake " we’re making a savoury Tibetan yeasted bread called Tingmos or Ting Momos (also called Te Momos by the Sherpas), which are not baked but steam cooked. If you’ve never heard of Tingmos before, they’re a steamed bread that is usually used by Tibetans to soak up everything from soup to curries and even spicy pickles/ sauces. 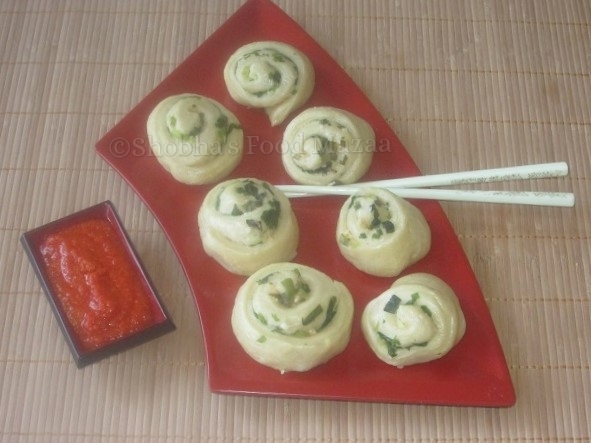 The Tingmo is a sort of a cousin to the Chinese steamed buns called Mantou and is also popular in the Indian state of Sikkim whch has a geographical border with Tibet. You can also generally find it on the menu at most Tibetan eateries all over India, along with Momos. 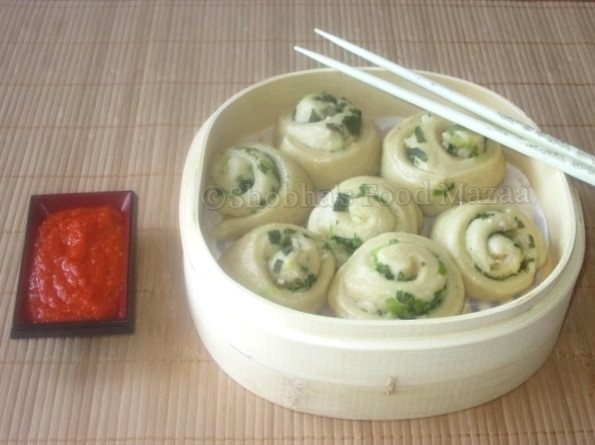 Chinese steamed buns, Momos and Tingmos all probably have a common origin. I think the traditional version of this bread actually doesn’t use yeast but only baking powder as a leavening agent. However, the ones with yeast come out nice and fluffy. This recipe is adapted from Rick Stein’s cookbook “India”,. 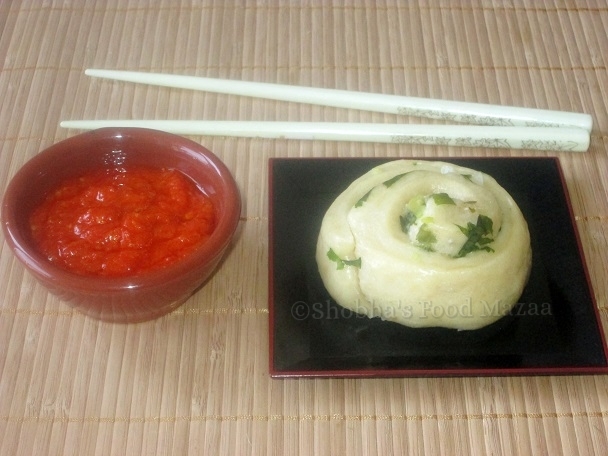 Rick Stein describes Tingmos as “spongy, slightly gelatinous little steamed Tibetan buns, pleasingly savoury with ginger, garlic, coriander and tomato. 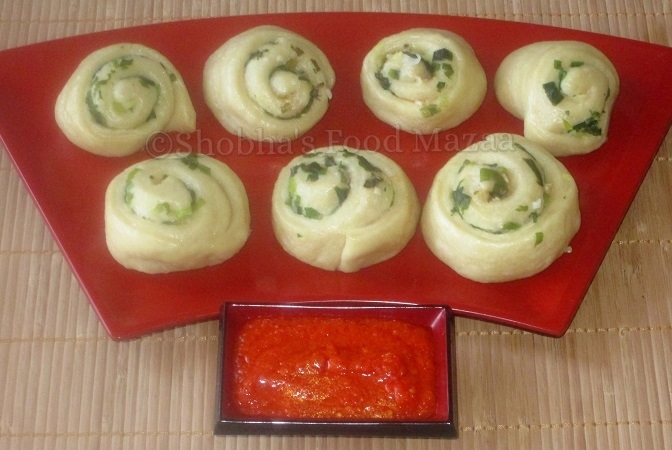 They are Divine when dunked into a rich curry or the very yummy Tibetan red chilli sauce”. Warm water ........ 1/2 cup or as needed. In a large bowl take the flour. Mix baking powder, yeast, salt and sugar. Make a well in the middle. Add enough warm water to make a nice smooth dough. Knead it well for about 2 minutes and set it aside covering the bowl for about 1 hour or until it rises to double. Brush the surface with oil. Spread the garlic paste and ginger. Sprinkle a little salt in the spring onion and leave for a minute. Squeeze out the water that has come because of adding salt. Mix the coriander leaves. Now spread this on the rolled out dough. Start rolling the bread carefully and tightly into a cylindrical shape like a Swiss roll. Cut them into equal sized pieces using a knife or dough cutter. Line the bamboo steamer with a butter paper. Place the bread rolls upright leaving enough space ( 2 -3 inches) between each one as they expand on steaming.Cover and let them aside for 15 minutes before you start steaming to allow them to rise again. Place the bamboo steamer in a big vessel containing water and steam the tingmos for about 15 to 20 minutes. Note: If you don't like the raw flavour of garlic you can saute the ginger garlic before using it for spreading. I prefer not to do it as there is not much difference once the buns are steamed. This recipe makes about 7-8 tingmos depending on the size you prefer. Moumita, you can steam them in a pot .. place them on a flat metal strainer and place it on a stand inside the pot. Thank you for linking up with us at @saucysaturdays! This reminds me of something really amazing that we had in Thailand. nice step by step explanation. I loved the ting momos but hubby didn't like them. I probably need to make them for someone else before I can post it on my blog. Thanks for linking up to #SaucySaturdays! What a creative recipe and I have never swirled buns before! What a cool recipe! Found you on #SaucySaturdays! I was so interested to learn about Tingmos, Shobha! I had not heard of them before. They look delicious. Sharing! Thank you for being a part of the Hearth and Soul hop. Do try out these April.. you will love them. so light and fluffy.